The famous London Harness Horse Parade will again take place at the South of England Centre, Ardingly, West Sussex on Easter Monday 2nd April 2018. This unusual Easter spectacle is a chance for the whole family to experience the sights and sounds of old England and see the history of transportation before their eyes. See how everything from eggs to beer was transported. Over 100 horse drawn vehicles and carriages, from Shetlands to Shires, will take part from all over Britain, together with a parade of the earliest motor cars, vintage tractors and historic motorcycles. 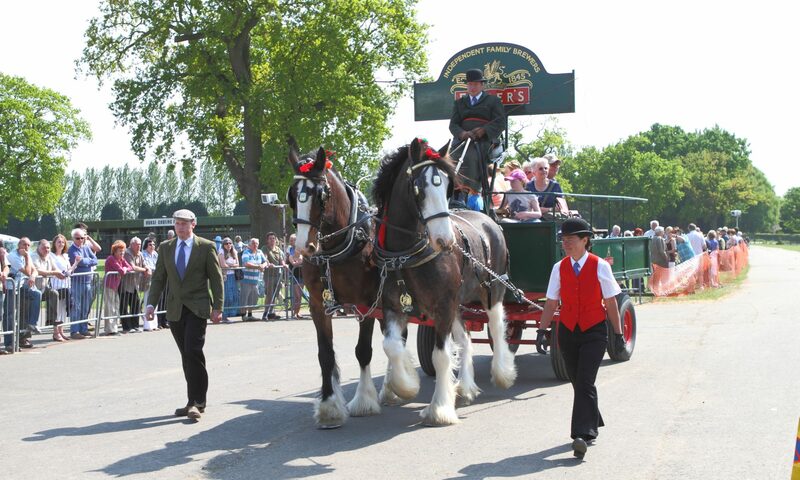 There’s also a chance to take a ride back in time on the Fullers Brewery Dray pulled by two of their magnificent Shires. This year the Parade will commemorate the end of WW1 with special displays of transport of that era. The Parade will be honoured with a visit from racing commentator, television presenter and former jockey Brough Scott MBE whose own grandfather was the noted Great War soldier “Galloper Jack” Seely. Brough Scott wrote a biography of his grandfather’s legendary WW1 horsemanship and this played a role in influencing the powerful book, film and musical “War Horse”. He has recently published “Churchill at the Gallop” and will be happy to sign copies. He will also be involved with the Presentations at the Parade together with The Master of the Worshipful Company of Glovers, Mr Alvan Seth-Smith. The annual event is an amalgamation of The London Cart Horse Parade (first started in 1885) and the London Van Horse Parade (started in 1904) and depicts transportation through the ages. This makes it one of the oldest and most well-loved carriage driving events in the country. Generations of carriage-driving families make the annual Easter pilgrimage to the Parade and the current President, WA Gilbey, is a direct descendant of the founder of the London Cart Horse Parade, Sir Walter Gilbey Bart. The London Harness Horse Parade has been a popular Easter spectacle for 133 years, and thirteen years ago moved from its central London location to the spacious, purpose-built South of England Centre in Ardingly, Sussex RH17 6TL with free parking and easier access. The Parade has since been expanded to include a display of the earliest motor cars to enhance the spectacle of how transport developed over the ages, allowing spectators to experience the changes from horse drawn transport to mechanically propelled vehicles. This annual Easter event is excellent value for a family costing just £8 per adult with children and parking free. This year the event will feature carefully selected stall holders for Easter shopping, together with stationary engines and horse drawn wagon rides. There will be plaiting, harnessing, shoeing and farriery demonstrations. There will also be a range of food outlets offering freshly cooked food to suit all the family. The 2018 Parade will take place on Easter Monday 2nd April with a static display of historic cars from 9am, the Veterinary and Farriery inspections at 10.15am, followed at 10.30am by judging of the light and heavy horse turnouts. The gates open at 8.30 am for spectators to watch the exhibits being prepared, admire the historic and classic vehicles in attendance and visit the trade stands to do some Easter shopping as well as enjoy refreshments. The Main Parade and presentation of prizes will take place following completion of judging and inspections later in the morning at approximately 1pm.